Work hard, play hard: not exactly 'Hinc lucem et pocula sacra', but nonetheless a sentiment just as sacred to the student body as any noble Latin maxim, splashed across every social media board and chat forum, and reiterated in every Freshers’ Talk and college guidebook. As a fresh and dazed first year, this was the mantra I set myself for repeating: the seductive promise of a balanced and universally-fulfilling academic, social, and personal life, at this institution where so many heroes and stars had worked and played their way to immortality and fame. However, what I found during my first year was quite a different experience. I thought the work would be a bit easier than it turned out to be (oh forsake me Gods of foresight), but, in contrast, I could not have imagined how enriching the experience of my extracurriculars would be. The trick was to manage it all – something I still haven’t quite managed, even after a year of trying. It was during a particularly good episode of Peep Show that I had a revelation. Mitchell and Webb, these phenomenally, nuanced and arch comic actors, had met at Cambridge; and, in a long line of acclaimed Cantab National Treasures, had developed their comedy partnership in the ADC and Footlights shows. Spurred on by my love of Peep Show, and a desire to procrastinate from my own work, I ripped through both of their autobiographies. Perhaps their intimate accounts of their own time at Cambridge would reveal to me the secret of their success. How did they manage it? Was the genius born in hurried moments between lectures, the spark discovered late at night, notes jotted on essay plans and timetable schedules? Did they see each other across the crowded UL Reading room and feel the flash of lightning? When the icons of film and stage crossed paths here, I assumed, their path would be set; they would just know what to do. It seemed that my heroes had not perfectly navigated the balance either. Robert Webb describes his lack of interest in academic life, which provoked several conflicts with supervisors and confrontations with the senior tutor; David Mitchell scraped a 2:2 after two years of solid 2:1s, having spent so much time honing his exchanges with his new-found friend at the theatre. I’m sure there are many, famous and unknown, who have enjoyed sparkling firsts as well as extensive extracurricular pursuits, but, frankly, you should be aware that you’re a) quite unique, and b) quite sickening as a person. In any case, comedy, creative thought, and journalism all involve a healthy disrespect for authority. A lot of your studies will be worthy of Robert Webb’s ‘Jacques Derrida prize for turning interesting stuff into impenetrable balls’. Spending one’s undergraduate career dutifully noting down every Golden Word from a beloved tutor might make you a better student – and congratulations to you – but it certainly won’t give you any good satirical material to pick apart in ten years’ time, or allow you to symbolically rebel against these bastions of power, a necessary first step in any kind of satirical or deconstructive work. Resist the urge to worship every instruction bestowed upon you by every academic authority. Do your work, but remember: the erudite masters who teach you chose a life of learning over a life of creative freedom. 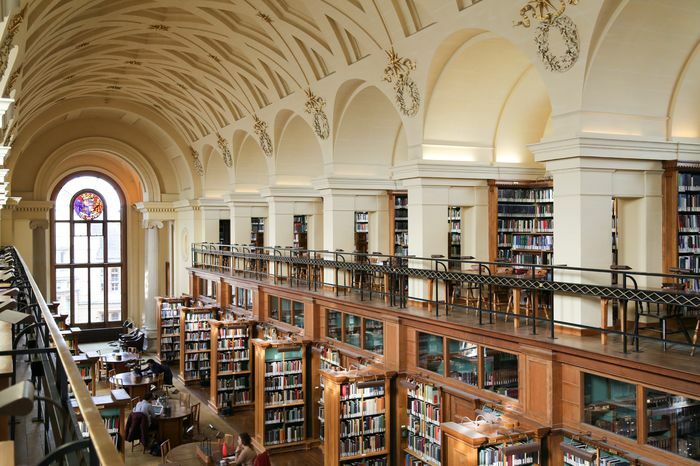 If Sacha Baron Cohen had spent all his time in Christ’s college library, cinema would never have met Borat; if Zadie Smith (who, incidentally, got a third in her Part 1 exams) hadn’t started to write in her free time here, contemporary literature would be all the poorer for it. It may feel impossible to carve out space and time to dedicate to developing your heart’s ambitions; do it anyway. Following these pursuits is not just a matter of de-stressing after a long day of work, but a crucial means of actually working out what one wants to do with one’s life and faculties; understanding this has been liberating for me, helping me to gain perspective over this test or that essay, whilst the uncertain half-formed shape of my dreamed-for future is given time and space to develop. On the subject of losing the lustre of one’s academic brilliance, student journalism is so full of cliches (think big fish little pond, to little fish swimming in a vast sea of intellectual sharks) that I will resist adding to the pile. It’s obvious that the transition from A* to average is a psychologically-disturbing leap. What could go some way to filling the gap is discovering a hobby or outlet of personal interest: whether that’s journalism, comedy, art, or, (if you’re really stuck), sport. Stop measuring your self-worth by your academic attainment, and start to reckon with your creative expression, which can’t be slotted on a graph or painted by numbers. If you drop a grade, like Mitchell and Webb, at least there will be something to sustain you. And if in doubt: watch Peep Show.